These works for wind octet by Klein, Kvandal and Yun are regarded as cornerstones of the recent literature, and they rest on a common aesthetic and ethical foundation, together with the newly-composed wind octet by Magnar Åm. Oslo Kammerakademi’s third recording, “the first beauty”, completes a trilogy of “Harmonie” music from three epochs. The ensemble has, right from its debut in 2009, had the ambition to embrace the entire breadth of classical chamber music literature for wind instruments — all the way from its origins in Vienna in the 1780s to the music of our own time. It is interesting to note that the works of all the composers featured here have ties to origins, whether specifically in relationship to this genre of music, or in a more spiritual-philosophical sense. The title of the commissioned work by Magnar Åm lends its name to the recording. The composer relates that the work portrays his philosophical anchoring in and experience of the world. 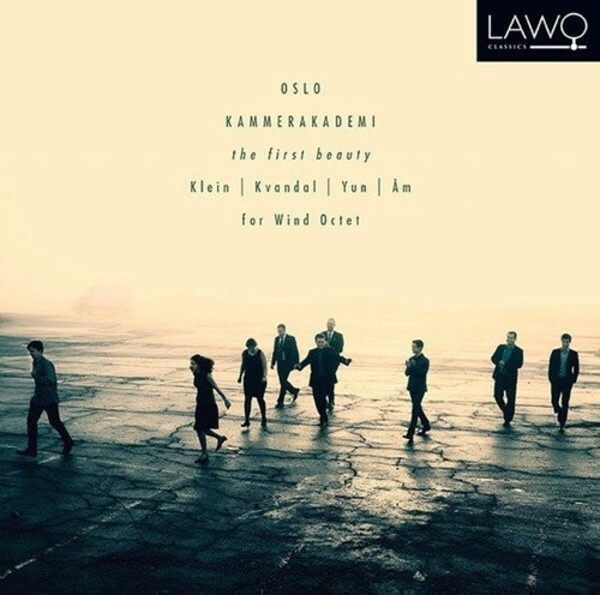 In 2012 Oslo Kammerakademi released its first CD, “Beethoven for Wind Octet” (LWC1036), and in 2014 its second recording, “Leipzig!” (LWC1058). Both recordings received glowing reviews in Norway and abroad. BBC Music Magazine gave the debut album five stars (of five possible)!